Charles Rowan Beye's critically acclaimed interpretive introduction to the epic poetry and poets of Ancient Greece, Rome, and Assyria is here reprinted in an expanded second edition with a new preface, new chapter on Gilgamesh, and an Appendix of Further Reading 1993–2005. For centuries the beginnings of the literary history of the West were defined by the Hebrew Bible—what most people call the Old Testament—and Homer's epic poems, the Iliad and Odyssey. These texts were once naively imagined to have come about in splendid isolation either as a miracle of divine creation or the spontaneous combustion of the "Greek genius". The mighty stream of words down over the millennia to our own time are so many generations of offspring still somehow beholden to their initial begetters. Thus do we construe Western Literature. Distinguished Professor of Classics Emeritus Charles Rowan Beye presents Ancient Epic Poetry: Homer, Apollonius, Virgil With A Chapter On The Gilgamesh Poems, an informative and interpretive introduction to classic epic poetry written for readers of all backgrounds including students, non-specialists, and scholars. Now in an expanded second edition with a new preface, a new chapter about the mythic figure of Gilgamesh, and an updated appendix of further reading, Ancient Epic Poetry familiarizes readers with history, tradition, backgrounds, philosophies, and much more pertinent to a more thorough understanding of ancient epic works. Highly recommended, especially for college library and classical poetry reference and literary criticism shelves. 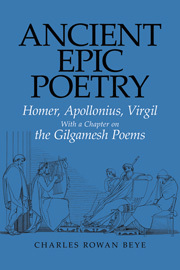 Ancient Epic Poetry Charles Rowan Beye Bolchazy-Carducci Publishers 1000 Brown Street, Unit 101, Wauconda, IL 60084 0865166072 $35.00 www.bolchazy.com Distinguished Professor of Classics Emeritus Charles Rowan Beye presents Ancient Epic Poetry: Homer, Apollonius, Virgil With A Chapter On The Gilgamesh Poems, an informative and interpretive introduction to classic epic poetry written for readers of all backgrounds including students, non-specialists, and scholars. Now in an expanded second edition with a new preface, a new chapter about the mythic figure of Gilgamesh, and an updated appendix of further reading, Ancient Epic Poetry familiarizes readers with history, tradition, backgrounds, philosophies, and much more pertinent to a more thorough understanding of ancient epic works. Highly recommended, especially for college library and classical poetry reference and literary criticism shelves. A joy to read. This is as wonderfully refreshing a book in the ‘09s as its earlier incarnation was in the ‘60s. Beye’s book was heroic a generation ago, has lived on vigorously into another, and promises (like Nestor) to stand out among the third. If I were to tell undergraduates to read a single book to accompany the reading of Homer, Apollonius, and Virgil in translation, it would be this one. This is an ideal book for people, like myself, who know no Greek or Latin but need to know where, how, and when our poetry began. Beye is, however, sceptical and humorous; he sees that for years many scholars have — in a polite way — lied about the cruel and violent worlds these superb poems describe. He is free of waffle. An authoritative book about classical epic, with a fine-tuned sense for lieterature as literature, written by a scholar who really knows how to write.